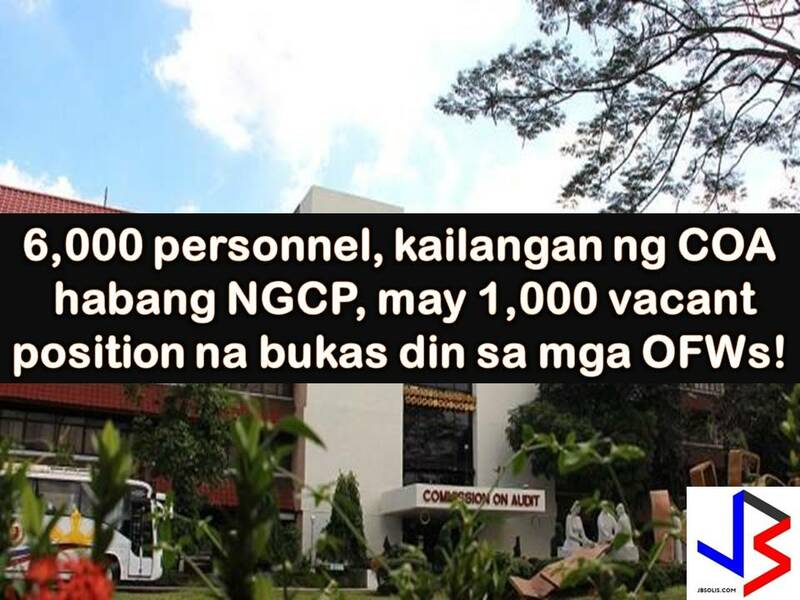 THOUGHTSKOTO Thoughtskoto : COA to hire 6,000 employees While NGCP Needs 1,000 Workers! COA to hire 6,000 employees While NGCP Needs 1,000 Workers! The Commission on Audit (COA) is in need of at least 6,000 employees to fill up unfilled or vacant position. COA Chairman Michael Aguinaldo said vacancies need to be filled in so that the agency can effectively perform its mandate to audit trillions on pesos being spent by government agencies. He said, that on the year 2000, there were close to 11, 000 filled position in COA, but over the next 10 years hiring employees has reduced. From 2000 filled position in 2000, it decreased into 8,000 in 2010. Due to lack of personnel, Aguinaldo said, one auditor, is auditing five to six cities or municipalities sometimes. COA Chairman added that to address the personnel shortage, systematic hiring has been implemented since last year. Read Also: POEA Approved Jobs to Malaysia and Hong Kong! Another problem of COA is the aging workforce as the average age of its staff is 54 years old. Aside from auditors, COA is in need of economist, financial analysts, actuaries, statisticians, and many others.With this COA is planning to push through the "extensive hiring program" next year to address the problem. Read Also: POEA Approved Jobs: Caretaker/Caregiver this August 2017! Meanwhile, the National Grid Corporation of the Philippines (NGCP) is also in need of 1,000 employees. These vacancies are open to Overseas Filipino Workers (OFW) who wants to work in the Philippines. Click here for the full list of job vacancies in NGCP. NGCP noted that they are hiring for a regular position with good benefits. For those who are interested, bring your resume and valid IDs to NGCP Offices nationwide.